Aurora 3D Animation Maker redefines the process by which sophisticated on-screen animations can be produced, by making it easier and faster. The program’s environment is intuitive and elegant, and provides a full range of tools and settings that empower the user to generate professional-looking video, Flash, GIF animation, and image sequence files. 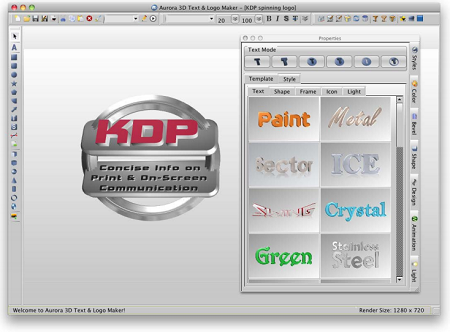 The program provides more than 3000 symbols, dozens of professionally produced project templates, more than 60 TrueType fonts (plus access to any TrueType font installed on the computer), and more than 80 object styles. These elements supply the user with a vast array of digital assets that can be combined in an infinite variety of ways, producing highly customized output. The workflow begins with the selection of a template from the library, or a blank project. 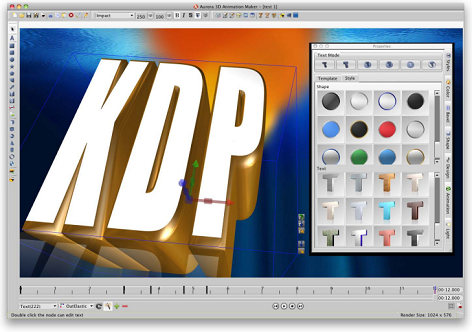 The user then edits and refines their animation adding or deleting objects and symbols; editing the text; adding particle effects, such as flames, snow and fireworks; adding motion effects such as bounce and curve; and adjusting the orientation, color, bevel, lighting and other parameters of the text and graphic elements. Again, it is easy and fast.